Have you ever noticed that visitors land on your Magento website directly from Google with a specific search term, but leave right away quickly? Are you losing customers as a result? Your website may not be converting as well as it could. Do you know that you have only split seconds to make the first good impression? To be more specific, you have less than 3 seconds. No wonder, time is precious on the web. So, how fast is your website? To begin with, over 47% of online consumers expect a website to load in 2 seconds or less. And that’s no surprise. In our modern digital era, emerging mobile technologies have forever changed the way we interact. We are always on the go with no patience to wait for the right moment. In the current environment, the demand is for ‘right now’. And no other way. That’s it. A one-second delay in page response can translate into a 7% reduction in conversions. What does it mean for your online store? Well, no one will wait until your website has loaded. It could cost you a big money in lost sales and customers every year. If you are a serious Magento store owner who’s interested in boosting sales and users engagement, it’s time to enhance your site with AMP technology and TemplateMonster has come up with a few premium eCommerce themes that support it. What is AMP? How Can It Help Your Online Store? Let’s face it, the number of users with mobile devices is increasing day by day, and it is vital for your pages to load faster on mobile screens. This is where AMP comes into play. Every AMP page includes AMP HTML, which is HTML with some restrictions for reliable performance, and the AMP JS library to ensure extremely fast rendering. It’s safe to say that AMP looks like a new way of creating fast-loading web pages. With its main goal of removing code that cause performance degradation, AMP makes users enjoy pages on mobile screens, keeping them on your site longer. How To Implement AMP In Magento? Zemez team just released its AMP module for Magento 2.2 and above. It optimizes your store to support AMP. Layouts for your pages are loaded without waiting for any resources to download, and resources are prioritized so that the most important are loaded first. Images or ads will be downloaded only if they are likely to be seen by users. This results in dramatically speeding up the performance of your Magento store, making your users and you happy. As the module is continuously developed an getting better, the advantages for your website are only likely to grow, too. TemplateMonster considers the six Magento themes that follow as among their best AMP-Ready themes. Feel free to check them out, and don’t forget to use our exclusive coupon code TOP10ECOMMERCESOLUTIONS to get 15% off any order on TemplateMonster. 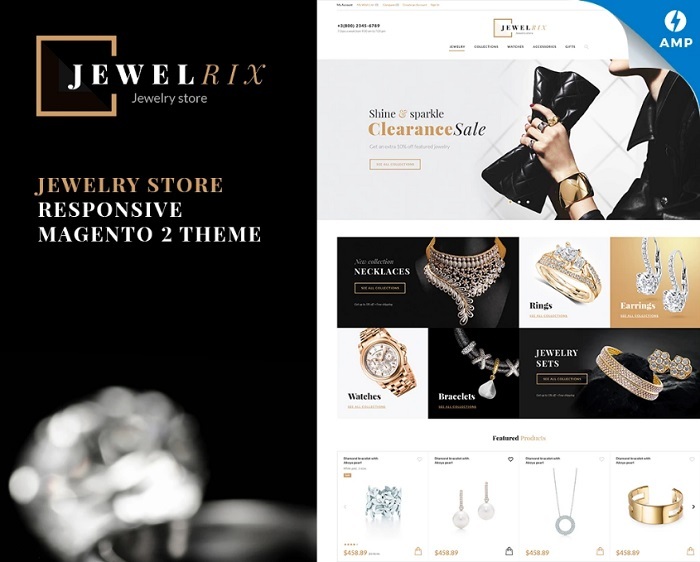 Explore the power of this incredible AMP-based Magento 2 theme. 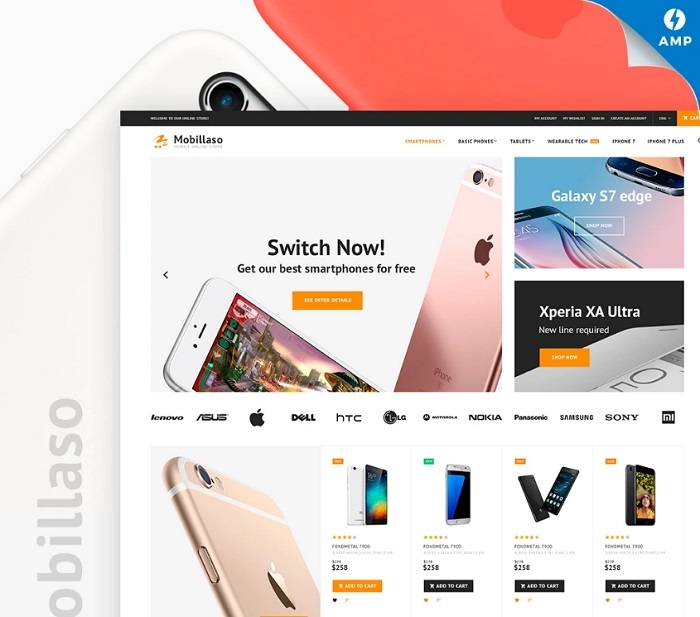 Designed for online stores selling different goods and services, it offers a huge range of innovative features allowing you to effortlessly manage your store and build a devoted audience. Enjoy its sleek design and responsive layout on any last-generation devices and screen sizes. 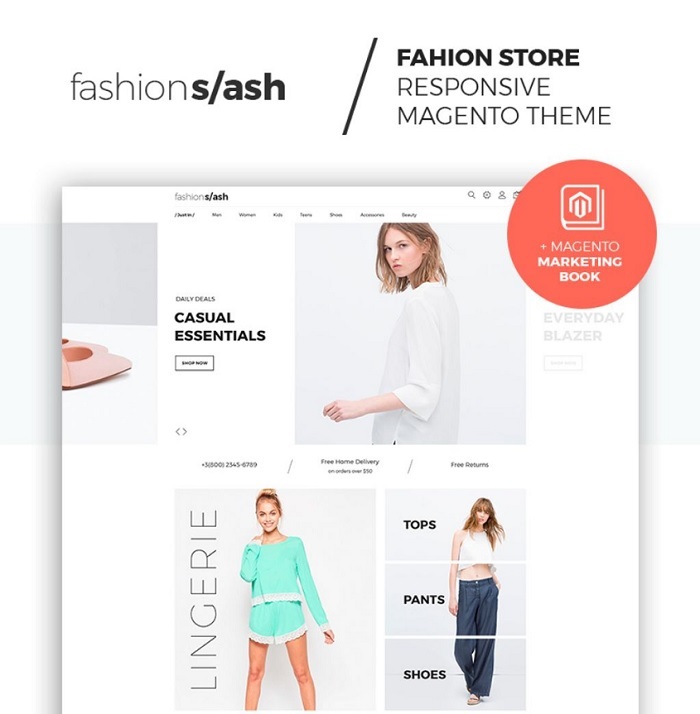 Take a look at this fascinating fashion boutique Magento 2 theme. With a full-width slider, you can showcase your best offerings and grab the attention of your visitors. Steal the show with elegant typography, multiple banners with gorgeous hover effect to stand ahead of the competitors. With AMP module, your mobile pages will load 4x faster. Wish to get your ideal shopping cart? Mobillaso can help spice up your online store and impress your target audience with a trendy and unusual design. Showcase your products in the best light, provide your customers with an extremely friendly shopping process. Help them spend more time exploring your offerings. 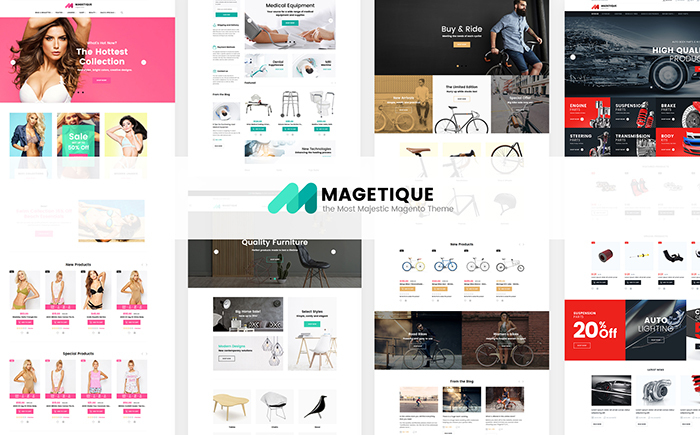 A modern Magento 2 theme can be a great choice for your next big thing. 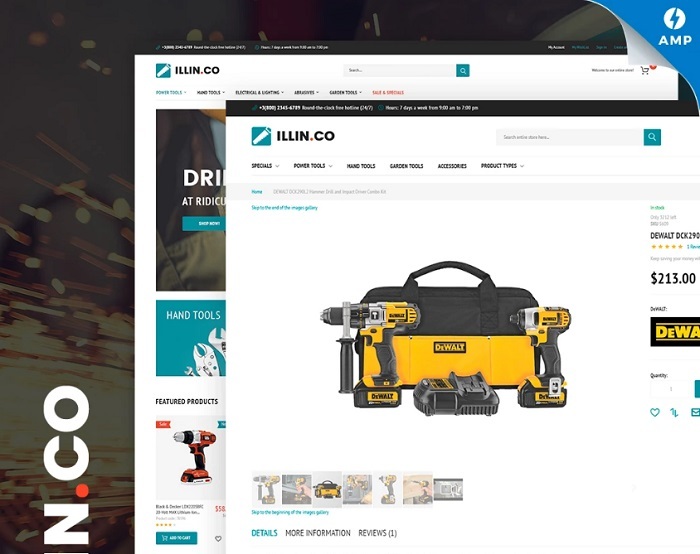 Crafted for tools and equipment stores, Illin.co can help you sell your goods like a pro. Moreover, this Parallax theme includes responsive layout, a bunch of Magento extensions, AMP module, and more. Make sure your website is responsive and looks awesome on a variety of devices. Spread the word about your glitzy online store with tons of bells and whistles. Don’t keep your visitors waiting. Looking for a powerful solution for your jewelry online store? End your search here. Jewelrix might very well be your best bet. Its clean and stylish design fits well for fashion and beauty web projects. With lots of customization options, Jewelrix can help expand the performance and functionality of your site. What’s more? Well, a sticky Megamenu, unique catalog and product pages, Ajax catalog filter, built-in newsletter subscription, and more. This trendy Magento 2 theme can be a great or better said the best solution for your fashion online store. Its card-based layout includes an edge-to-edge slider and a set of product banners to help impress your visitors right from the start. The fixed right sidebar provides quick access to the live search, settings, shopping cart, and user’s account. 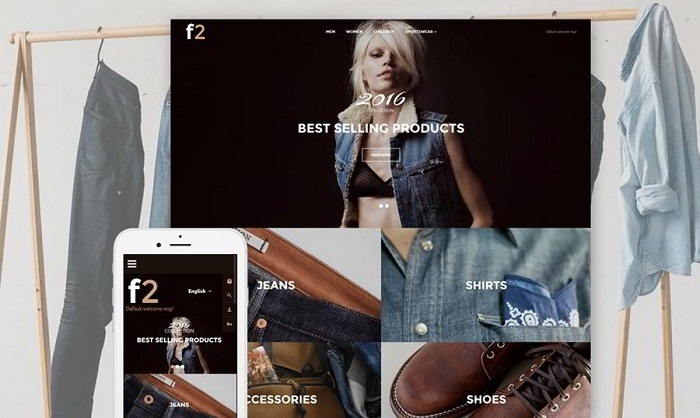 F2 comes with tons of advanced features so you can easily adjust it to fit any eCommerce web project.